Interpol has issued a Red Notice for LNA Special Forces officer Mahmoud Werfalli (Photo: Interpol). Interpol has issued a Red Notice for the Hafter-led LNA Saiqa (Special Forces) officer Mahmoud Werfalli. 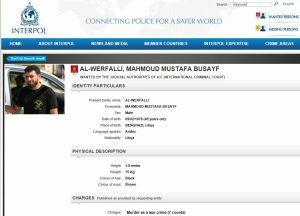 The notice states that Mahmoud Mustafa Busayf Al-Werfalli is ‘‘wanted by the Judicial Authorities of the International Criminal Court’’ adding that the charges are ‘‘Murder as a war crime (7 counts)’’. Werfalli is accused of summary executions of suspected terrorists/extremists based on video footage that appeared on Libyan social media. Asharq Al-Awsat also reported Talal al-Mayhoub, chairman of the National Defense and Security Committee of the House of Representatives in Tobruk, as saying that “Libya will not hand over its sons.” He had added that Werfalli was under investigation in Libya and raising the issue is part of an attempt to discredit the army and its leadership.